The IMEEA® 18/10 Stainless Steel Turkish Coffee Maker with IMEEA lifetime warranty. Buy with Confidence! High Quality Material: 18/10-stainless-steel interior; magnetic stainless-steel exterior ( The use of electromagnetic oven requires magnetic ); one layer of pure aluminum core sandwiched between two stainless steel layers. 3-Ply construction ensures optimal heat distribution and storage. 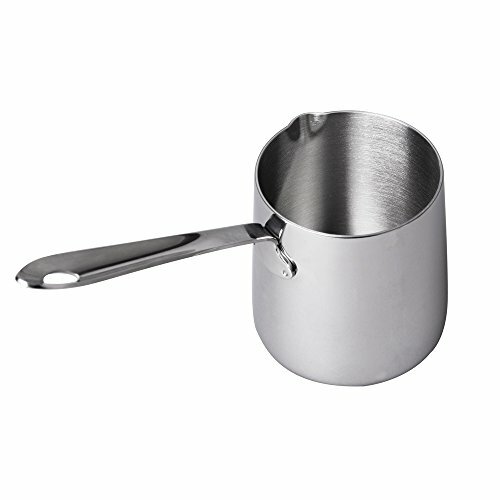 NOT suitable for all induction cookers: This pot has a contact area of about 3 inches so if using on an induction cooking surface make sure your cook top will accept this small pot. Easy For Storage: Handle features a hole on the end for optionally hanging from your pot rack for storage. This butter melting pot perfect for preparing Turkish coffee, warming gravy, melting butter or chocolate, heating up sauces and more. Suitable for 1-2 people to use. MIND ITS SMALL SIZE! Dimension: Top Diameter: 2.9inch/7.5cm; Bottom Diameter: 3inch/8cm; Height: 3.8inch/8.6cm; Handle Length: 4inch/11cm. N.W: 8.4oz/240g. Comes with IMEEA lifetime warranty, buy with confidence!